The very first booth at the Montreal show, in the Hilton Bonaventure hotel lobby, showcased Sennheiser’s extensive range of headphones, many on active display. Heading the lineup was the formidable HD800, which we reviewed a little while back (you can read the review HERE), not new but still sensational, and driven for the occasion by a Grace 902 headphone amp/DAC. 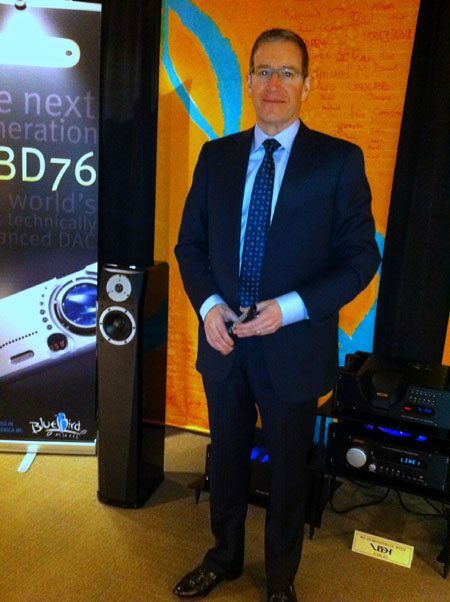 At the display, Sennheiser’s National Sales Director Gilles Marcotte showed me a bevy of new products. The HD890 headphones felt very comfortable and contain E.A.R. technology as well as a compressed cellulose fleece. The lightweight PX90 headphones, a throwback to the HD 414 that put Sennheiser’s name on the map, sounded really impressive through my iPhone but I preferred the similar PMX90 which features a neckband for ultimate comfort. Some Sennheisers on display were co-branded with Adidas, like the HD 220 shown here. The CX980 canal phones with integrated volume control are particularly impressive and I hope to bring you a review soon. 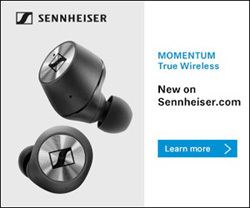 Sennheiser’s range is simply staggering. They have headphones for every occasion and they are built superbly well. I’m always happy to welcome a new Canadian manufacturer. 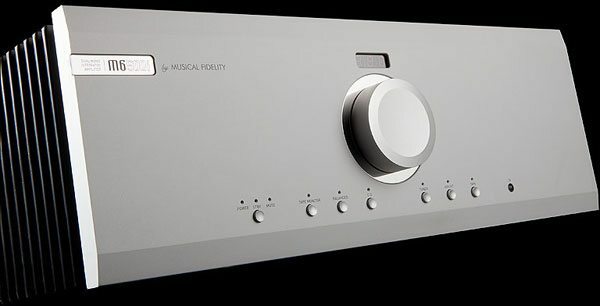 Out of the embers of Sonic Frontiers comes BFA – Beyond Frontiers Audio with its first product, a hybrid integrated amp with a built-in high resolution DAC. BFA has shown prototypes of this amp before, but now it is in production and is to be followed by a full range of electronics. 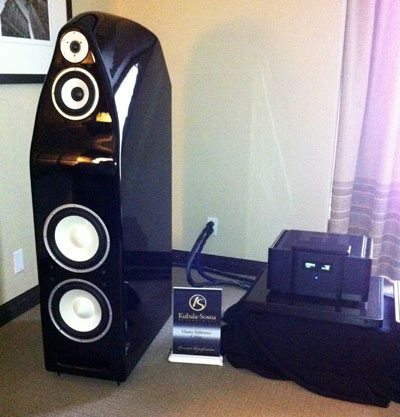 This exotic component (around $17K) was making glorious and highly resolved sounds, fed by an Acoustic Arts CD transport and driving full range Hansen Emperor speakers (also Canadian) connected up with Kubala-Sosna cables. The presenters played one of my discs on the system and I found this to be among the best sounds of the show. The Tulip amp boasts a Japanese shunt relay volume control, a 1600 watt dual primary power transformer and puts out 180 wpc with no feedback. 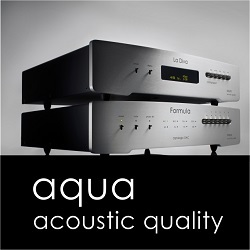 The DAC section uses 24-bit/192K resampling Cirrus Logic and Burr-Brown DAC. 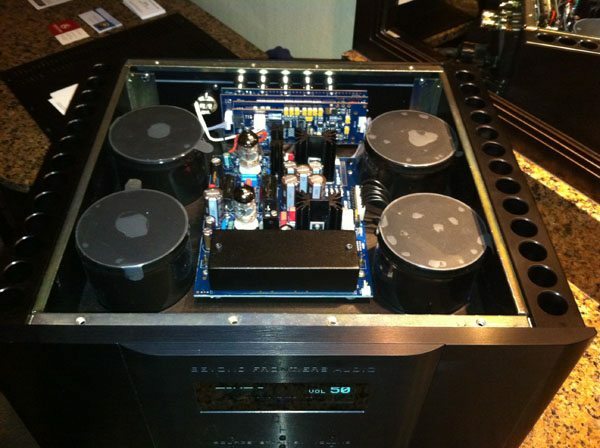 The preamp stage uses Tesla tubes while the power amp section uses bipolar transistors. All components are of the very highest quality, and I thought you’d like to see inside the box. 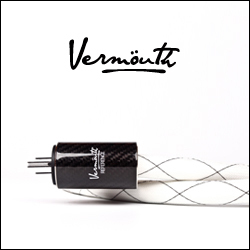 Another excellent Canadian speaker manufacturer is Verity Audio. 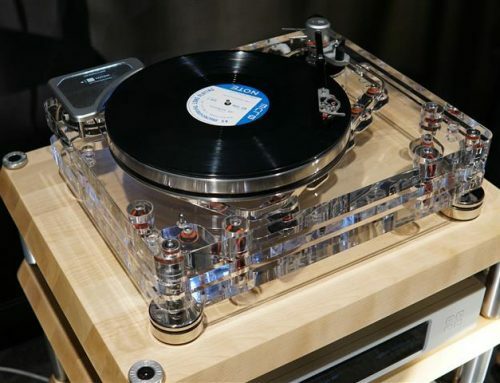 The company did not have anything new to show this yes, but did demo its fine Sarastro II speakers (around $40K) driven by the beautiful new Nagra 300i integrated amp (20 wpc) from Switzerland. This push pull 300B based tube amp made an appearance at CES in January but this was the first time I had the opportunity to hear it. The highly efficient (93dB) Sarastro II made an ideal partner, highlighting the warmth and clarity of the recordings and producing a far bigger sound than I expected, a big improvement over Nagra’s earlier pyramid shaped amps. I liked the sound so much, I kept coming back for more, but I’m afraid if you have to ask the price, you can’t afford it. 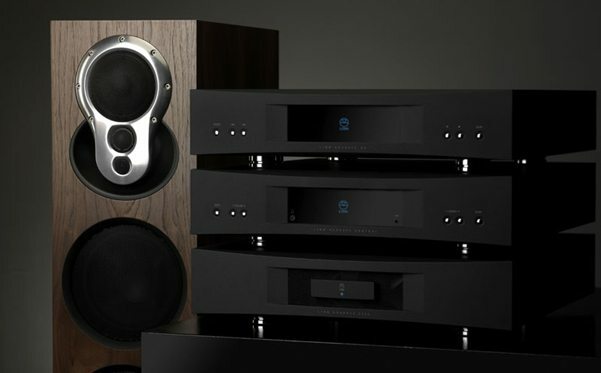 Verity is developing a new very large speaker system, the Monsalvat, which looks simply spectacular and, knowing Verity Audio, I have no doubt it will sound as good as it looks but you might have to sell those Apple shares to get a pair. 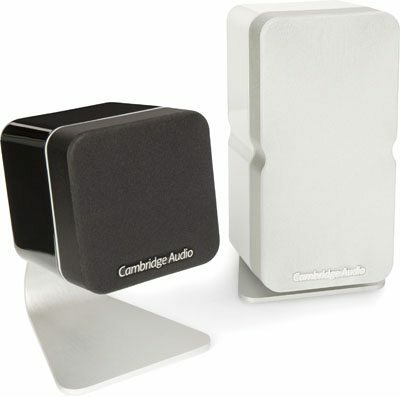 At the opposite end of the spectrum, the tiny Cambridge Audio Minx speakers were making outrageously big sounds in retailer Audio Occasion’s room. 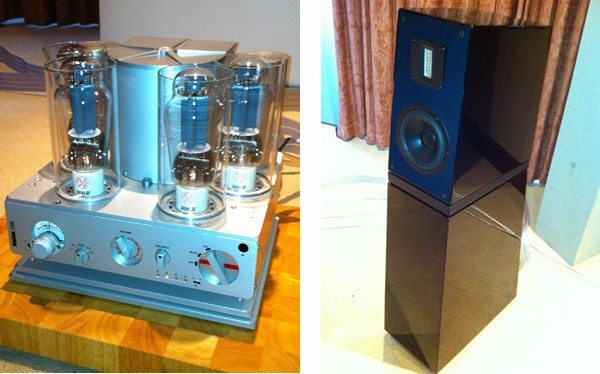 The Min10 sells for $90 and is slightly larger than a 3 inch cube, while the Min20 stacks two drivers together for $180. Inexpensive stands are available starting at $18 each and you can choose from a range of three subwoofers. 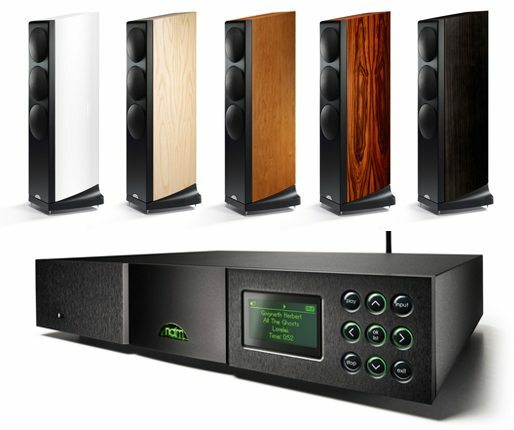 Cambridge offers several bundles for stereo and surround-sound listening, like the pictured S325 5.1 Minx system ($1495), and I recommend you check these out immediately. 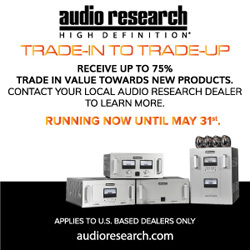 Cambridge Audio is well known for producing inexpensive gear, usually cool looking, with an amazing sound to buck ratio, and now they’ve done it again. Having spent some quality time with the unfailingly inventive and resourceful designers, I’d say you should keep your eyes open to anything new they spring on the market. 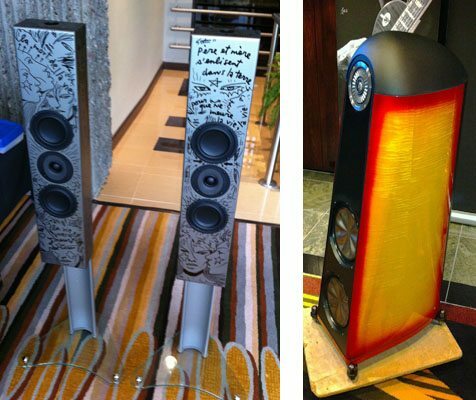 Making a strong visual statement at this year’s show were two sets of hand painted speakers, which were auctioned off for charity. The Totem Tribe on-wall speakers offered monochromatic cartoon art, while the Thiel 3.7 Gibson “Burst” Edition is one of 26 pairs decorated by the fine craftsmen at Gibson Guitars to match a Gibson Les Paul, and signed by the legend himself, sadly no longer with us. I was among the fortunate few to attend Les Paul’s 90th birthday celebrations in Las Vegas in 2006, and sat at the feet of the master as he played and talked for hours – what an inspiration. Both the Tribe and the 3.7 are not just clothes horses. Each is an example of high technology bringing impressive performance to market from designers who command the respect of all in the industry. The late Jim Thiel passed away in 2009 and the Thiel 3.7 represents the culmination of many innovations and refinements in speaker design over dozens of years. Totem’s Vince Bruzzese has a similar reputation for going his own way and developing new drivers which rewrite the rules for how much high quality bass you can get out of small enclosures, and won a lifetime achievement award at the show for his contributions to the industry. The Tribe in-wall and on-wall speakers represent a breakthrough in performance for shallow boxes. New from Scotland’s Linn Audio at the show were the Akurate Kontrol stereo preamplifier ($7800), the Akurate DS digital streamer ($8288) and the Akurate Power Amp ($6140 for 2-channel or $9120 for 4-channel). Akurate Kontrol offers balanced and unbalanced outputs, a high quality headphone output and includes a MM/MC phono section, a rarity these days, all in a compact, attractive package. 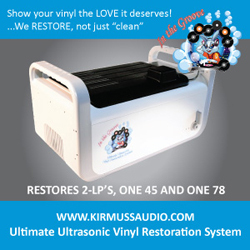 Akurate DS decodes FLAC, WAV, MP3, ALAC, WMA, AIFF, AAC and OGG formats with up to 192K/24 bit native sample rate, and is compatible with UPnP servers, connecting through standard Ethernet connections and bringing you all that wonderful Internet radio. The Akurate series sits between the entry level Majik series and the go-for-broke Klimax series, and comes in your choice of black or silver finish. One time Linn partner and now equally digital savvy Naim showed a very interesting new speaker in Montreal, the Ovator S-400 ($6,495) baby brother to the S-600 ($12,995). 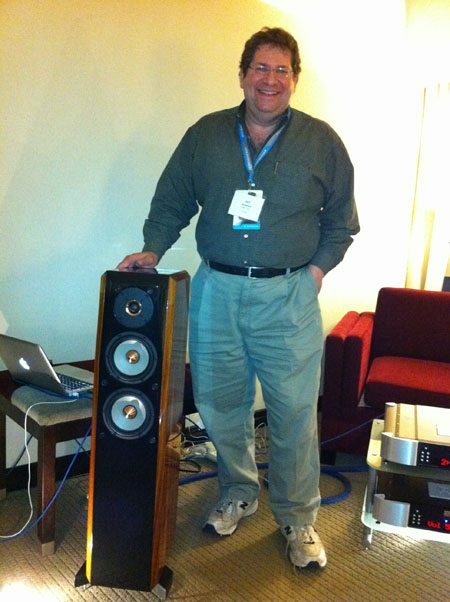 Ovator S-400 is not only a very good looking speaker, it’s also tremendously dynamic and musical. It appears to be an outstanding bargain. Among its features you can count a steel leaf spring decoupling the enclosure from the plinth, laminated and air-cored inductors and metalized polypropylene capacitors in the computer designed crossover and a rigid multi-composite enclosure. Naim’s new Network Player is the NDX ($5495) offering a huge range of features including UPnP, Internet Radio and wireless communications, controllable from an available iPod/iPhone app. Naim Audio, amongst the most respected names in the industry, is based in the small English Cathedral city of Salisbury, about 30 miles from where I was born, and closer still to the magnificent ancient monument of Stonehenge, now understood to be the site where the Druids gathered at midsummers day to listen to the latest stereo gear. 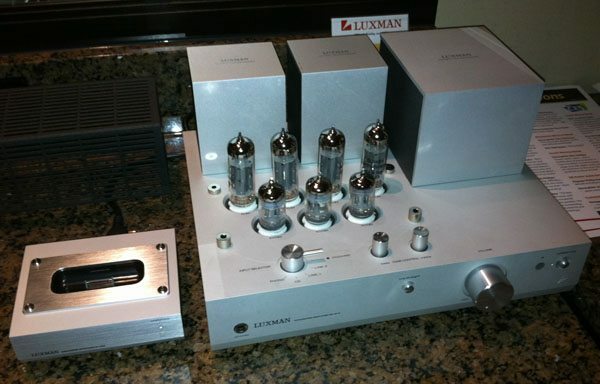 Luxman is a venerable Japanese manufacturer (founded in 1925) happy to sell you an amp for a few thousand bucks or for twenty times that. But everything they make has the same exquisite finish and sharp lines, and is both designed and built in Japan. 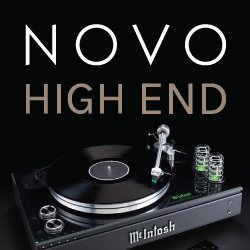 Luxman is represented in North America by Phil O’Hanlan’s On a Higher Note. Phil is a great music lover and bon-vivant, who over the years has introduced me to some extraordinary new equipment, like the high tech Vivid speakers that was playing in his room, and some excellent Irish whiskeys. 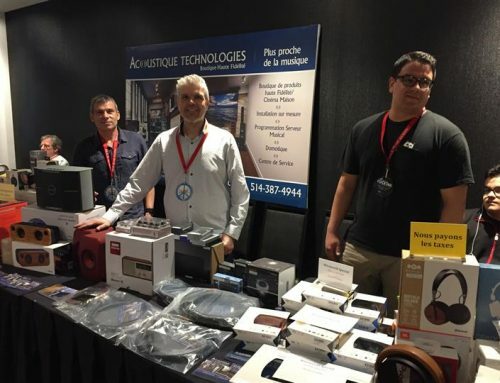 New In Montreal were the DA-200 DAC ($2900 US) with Coaxial and Toslink inputs up to 192K/24-bit and a USB input at up to 96K/24-bit and the very interesting Neo Classical, their first integrated amp with a digital iPod dock, remote control and a high quality headphone output ($3500 US). Sweet! I have requested a Neo Classical for review in these pages. For a spectacular quality of fit and finish, so highly polished you can use it as a shaving mirror, look no further than Burmester, which presented its spectacular Top Line 100 Phono Preamp (from $16,995). 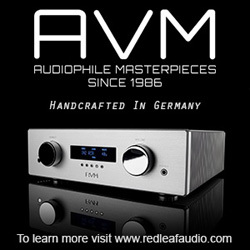 It gives you control over input impedance for moving coils and input capacitance for moving magnets, multiple gain options, a defeatable subsonic filter, auto adjust option to bring the left and right channels into balance, a fixed or variable output, phase reversal and an optional A/D converter. The remote control provides control over Input, Load, Gain, Subsonic, High/Low output, ADC, DIM, Volume and VU-meter. 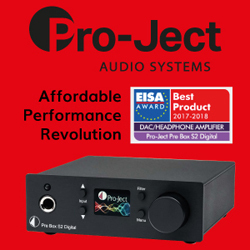 The preamp offers two balanced inputs, with settings stored separately for each input, and provides both balanced and unbalanced outputs. Even the feet get special attention, being made of carbon fibre to reduce microphonics. But don’t get the wrong idea. Top Line is not their top of the line – that honor belongs to their Reference Line, then comes Top Line, Classic and Rondo. 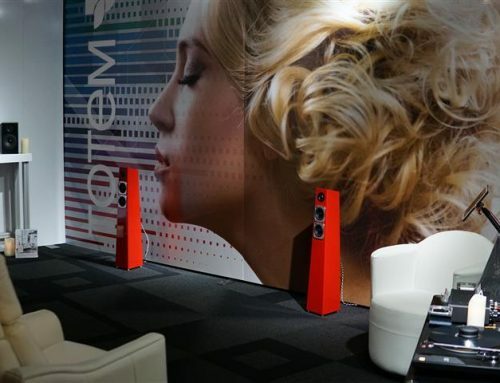 Danish speaker manufacturer Peak Consult, the brainchild of Per Kristofferson, is now distributed in North America by Bluebird Music, and showed the new Princess XE speakers ($24,000 US), a high performance version of the standard Princess speakers. 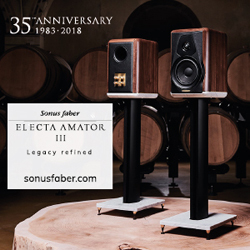 Standing 41 inches tall, it features an expensive hand- built 5 inch midrange driver from Audio Technology and a 1 inch Scan-Speak tweeter providing a flat frequency response over a wide listening angle. 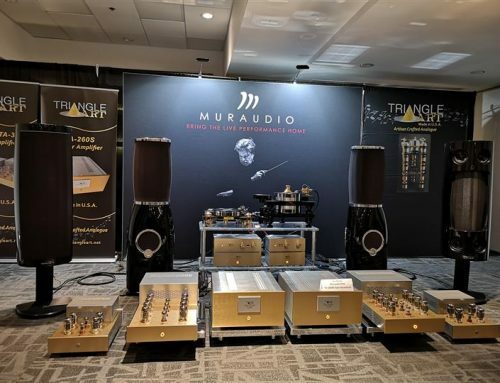 Powered by the spectacular Chord Electronics Red Standard CD Player ($14,900 US), CPA 5000 Preamp ($21,900 US), SPM 1400 Mon blocs ($32,900) and connected by Van den Hull’s new MC3T Mountain interconnects ($3490m US) and Nova Speaker Wire ($3295 US), this $100,000 system played cleanly at all levels with excellent imaging. 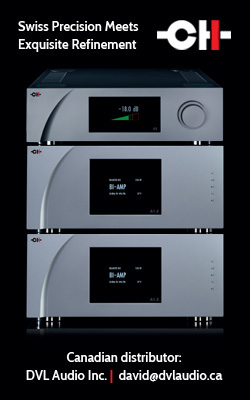 Chord Electronics is well known for their early adoption of high frequency switching power supplies, later adopted by Linn and others, which increase efficiency and enable a smaller chassis to be used. But they are equally well known for their futuristic industrial design, which would be at home in the Museum of Modern Art. Bluebird’s Jay Rains is shown here with the Princess XE. 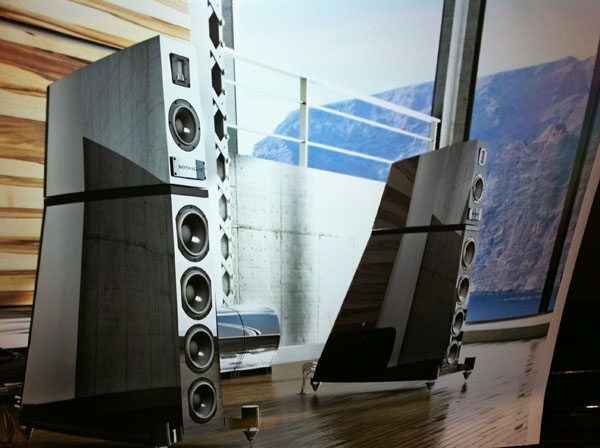 New York based manufacturer Joseph Audio showed the Perspective speakers ($11,800 US) to very good effect, producing a lively and most musical sound. 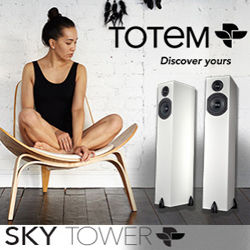 Key to their design is the patented Asymmetric Infinite Slope technology, which allows woofer and tweeter to work together without the usual interference between them in their areas of overlap. Conventional high order filters often lead to poor performance around the area where the tweeter meets the midrange, and Joseph Audio claims to have solved these problems, but they weren’t prepared to reveal to me the Caramilk secret so I can’t tell you how they do it. The Perspective incorporates crossover improvements made in the top of the line Pearl 2 applied to two 5.5 inch magnesium woofers and a 1 inch Sonatex dome tweeter. 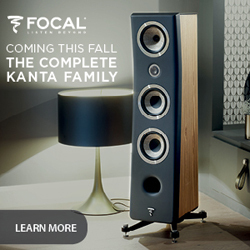 The manufacturer claims strong performance over a wide listening area, and a tube friendly load. 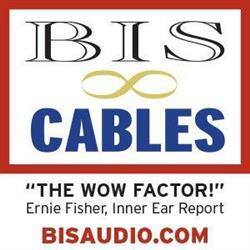 Cardas cable is used inside, which is always a good sign. Perspective is the third speaker in their new Reference line, the others being the Pearl2 ($28,500 US) and the Pulsar ($6,999 US). You can specify the side panels in black, cherry, maple, rosewood or sepele with the rest of the cabinet sporting a piano black high gloss polyester finish. Here is a smiling Jeff Joseph standing with his new baby. 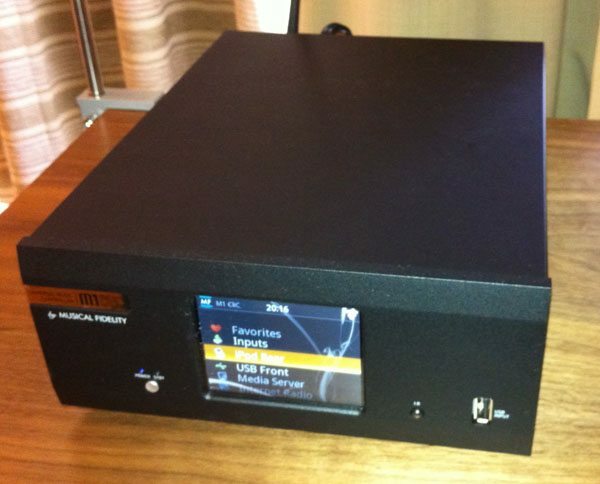 UK manufacturer Musical Fidelity gave us a preview of its new Music Streaming device the M1CliC ($1999 US), offering 3 digital and 3 analog inputs, wireless/Ethernet connectivity, Internet radio and both fixed and variable outputs. 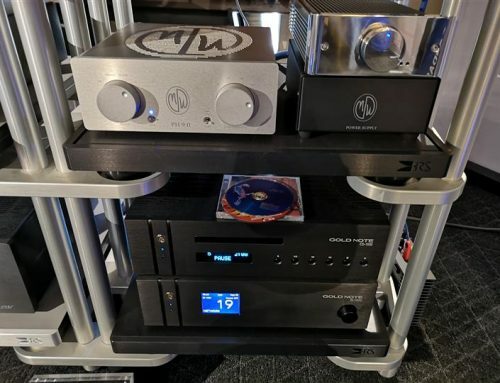 Also new was the ultra-powerful (500wpc) M6 500i Integrated Amplifier ($7000 US) and the inexpensive V-Link ($169 US) asynchronous USB to SPDIF converter, ideal for feeding your computer’s digital audio to your DAC. The M6 500i weighs a truly impressive 62 pounds and offers 1 balanced and 4 unbalanced inputs, line level and tape outputs, and two sets of speaker posts. It’s a dual mono design with a separate power supply for each monbloc power amp and another for the preamp section. The volume control is a digital design with exact channel tracking across its 0.5 dB increments. 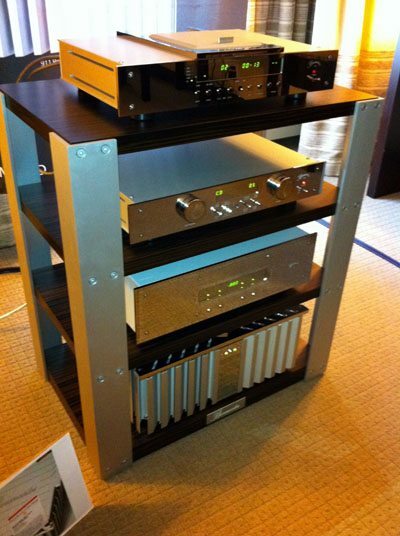 Four Titan amplifier modules in bridged pairs perform the heavy lifting. Measured linearity and distortion levels across all frequencies are superb. 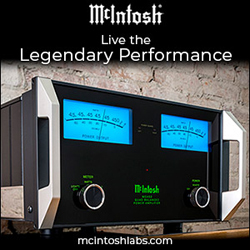 Musical Fidelity is throwing down the gauntlet, challenging the superiority of separate pre-power amplifiers with their massive single chassis powerhouse. This wraps up my coverage of the 2011 Salon Son & Image. 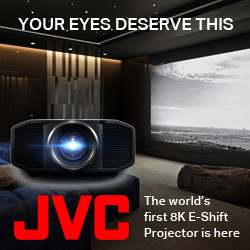 Next up in show business – the first edition of the Toronto Audio Video Entertainment Show www.taveshow.com.